Following the unveiling of a floating cycle path proposed for the River Thames, we've collected together 13 controversial projects from the pages of Dezeen that could transform London. 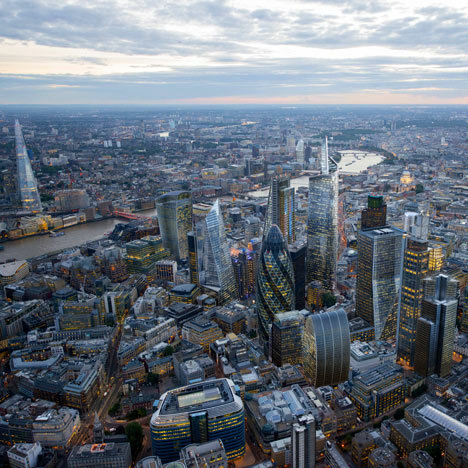 Fuelled by rising levels of investment by developers, a need to house a growing population and the necessity to improve infrastructure, London is rapidly evolving. The proposals below have ignited debates in our comment sections on issues ranging from cycling and transport to the value of public space and the provision of affordable housing. "The idea is simple," says Thomas Heatherwick. "We will connect north and south London with a garden." Proposed for a site between the existing Blackfriars and Waterloo bridges, Heatherwick's garden bridge design for pedestrians features two fluted piers supporting a tree-lined walkway. Perhaps one of the most controversial projects we have featured recently, this network of elevated pathways above London's railways is designed to create safe car-free cycling routes. This futuristic 300-metre skyscraper for London was designed for the SuperSkyScrapers Awards, a competition seeking an "inspirational typology for a high-quality organic skyscraper concept to be used as a tech city". Would you swim in the River Thames? Perhaps not in its current murky and brackish state, but London office Studio Octopi was looking ahead to 2023 and the arrival of London's Super Sewer – a new sewage tunnel that would make the river's waters clean enough to bathe in – when it initially unveiled a plan for a floating swimming pool. Joseph Paxton’s Crystal Palace in south London was one the world's biggest glass building when it was built in 1851 to house the Great Exhibition, but was destroyed by fire in 1936. It remains one of the city's most important lost buildings, so it was no surprise that plans to rebuild it now would provoke controversy. From the redevelopment of one iconic London landmark to another. Battersea Power Station in south London is an important relic of the city's industrial past, but has sat derelict for decades as developers failed to find a way to repurpose the huge protected building. This 73-storey skyscraper at Canary Wharf, one of London's major business districts that houses a cluster of tall buildings in east London, is set to become the tallest structure dedicated to housing in the UK. Joining Foster + Partners in building up Canary Wharf are Swiss architects Herzog & de Meuron. This cylindrical skyscraper is one of five new buildings in the Wood Wharf development at the eastern end of the district. The final section of New York's acclaimed High Line – the project that transformed a disused section of elevated railway into a public garden in the centre of the city – has just completed, prompting renewed calls for London to implement something similar. London is one of the most important cities in the world for arts and culture, which play a strong part in the growth of the city's economy. At the heart of this scene is the capital's infamous art schools, colleges and universities, including Goldsmiths in south London. Also due to open next year is this gallery in a run-down area of Vauxhall, south London, which will host the collection of British artist Damien Hirst. Housing is the hottest topic in London right now, with residents complaining about rapidly escalating prices and politicians under pressure to provide more affordable accommodation and social housing. This scheme by David Chipperfield and Karakusevic Carson will feature two hexagonal tower blocks, creating 198 homes for the Colville Estate in the borough of Hackney. The private apartments are meant to help fund the creation of 438 affordable homes elsewhere on the estate. A bottle of water in the capital can cost as much as £2, so its no wonder that these proposals for six public water fountains, designed by some of the UK's leading architects, proved popular with our London-based readers. Main image by architectural rendering studio Hayes Davidson.